Planting trees is always special, you get that wonderful feeling that you are leaving your mark on the landscape for a very long time. We probably plant on average 20 trees per year on the estate that’s not including all of the hundreds of trees for hedging. At the moment; we probably lose about 3 trees (all ages) per year due to stress and winds; I have just put in tree applications to remove one dead and one in serious decline. But we always replant and with more than enough. I never replant in the same spot with a tree species from the same family to try and reduce the risks of pest and disease issues and whenever possible I will look slightly further afield to more open areas of the gardens to replant to give the trees a better chance in life. Tree surveys need to be completed yearly and for any trees that I am concerned about I always get a second expert opinion from a good qualified arborist. 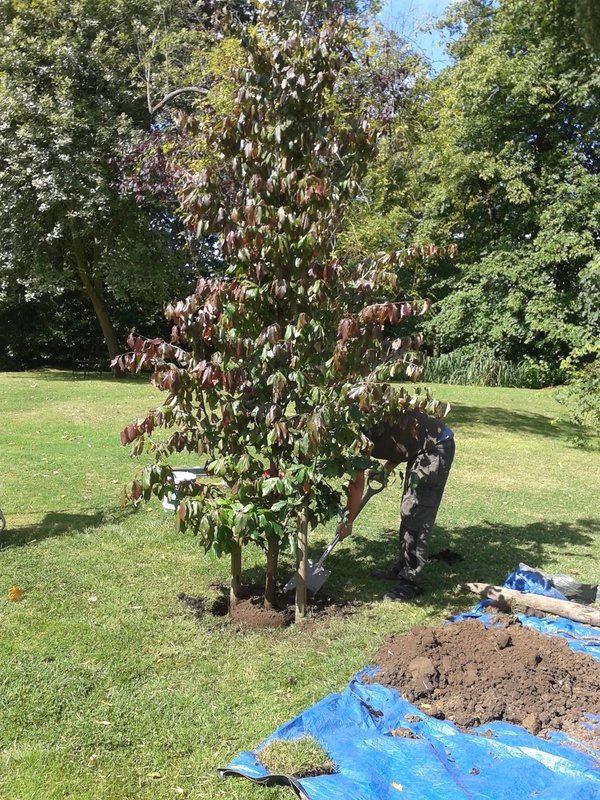 This week we planted a beautiful Parrotia persica, “Persian Ironwood”, a fabulous specimen as can be seen below. It is going to love the great open space and lots of sunshine to colour-up its leaves with gorgeous reds in the autumn before the fall.